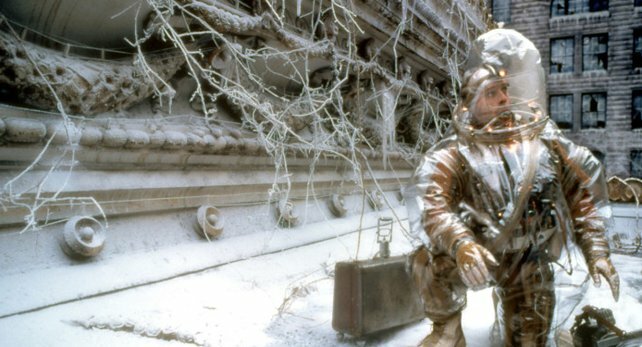 Whether it be a remote cabin in the woods, a research facility in Antarctica, ghost towns, cornfields, or cemeteries, film settings are as important as their characters for they have the capacity to convey feelings of dread and tension or to server as the basis for creating places never before imagined. Industrial locations have been favorite choices for film directors and set designers, particularly in the horror and science fiction genres. Within metal forming factories, large warehouses, and power plants, tales of terror are brought to life and futuristic landscapes are conceived. These settings work well to establish an atmosphere that can be isolating or foreboding. A great industrial set can become a place with a hidden past, full of shadows and cold surfaces. Delivered effectively, a memorable film location can stay with its audience long after a movie is over. In celebration of Halloween and everything industrial, here is our list of the 13 best industrial locations in horror and science fiction films. Director Terry Gilliam of Monty Python fame is the visionary behind cult classics such as Time Bandits (1981), Brazil (1985), and The Fisher King (1991). With 12 Monkeys, Gilliam needed to create a retro-futuristic setting that was dystopian and possibly a figment of his protagonist’s imagination. Utilizing what Gilliam described as “cathedrals of technological progress” — nuclear plants, factories and power stations — he created a vision of a collapsed future civilization that still relied on previous technology. Not necessarily the best film adaption of a Stephen King short story, Graveyard Shift takes place in a textile mill where employees begin meeting mysterious deaths during, you guessed it, the graveyard shift. Filmed in the village of Harmony, Maine, the set for the textile plant was the real Bartlettyarns Inc., the oldest woolen yarn mill in the United States (est. 1821). When an American submarine sinks, a search and recovery team works with an oil platform crew to recover the vessel. Deep in the ocean, they encounter strange alien lifeforms. The Cherokee Nuclear Power Plant, a never-completed energy project in South Carolina, served as the underwater film location for many of the scenes involving a submerged oil rig. Using the rig proved more cost effective and safe than shooting in the ocean. 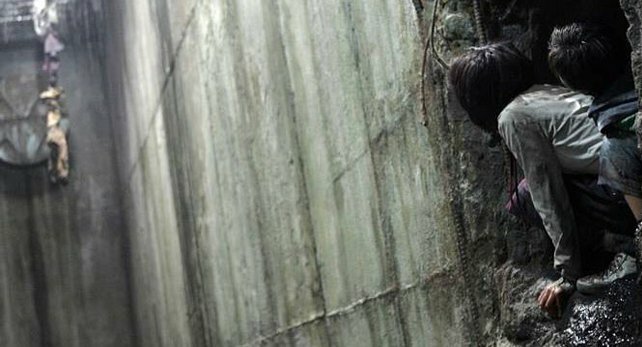 This South Korean monster movie launched the career of Bong Joon-ho, who went on to direct 2013’s sleeper hit, Snowpiercer. The Host centers on a man’s quest to rescue his daughter from an underwater monster in the Han River. Many of the scenes were filmed in actual sewers near the Han, which motivated the production to inoculate the crew against tetanus prior to filming. The Taylor Meat Company is a meat processing plant in Taylor, Texas, that has been producing smoked meats for half a century. When the Texas Chainsaw Massacre franchise rebooted in 2003, Taylor Meat Company allowed the filmmakers to shoot scenes in and around its facility at night. At its height in the 1940s, Westinghouse employed 20,000 workers at the location now known as Keystone Commons in Turtle Creek, Pa. 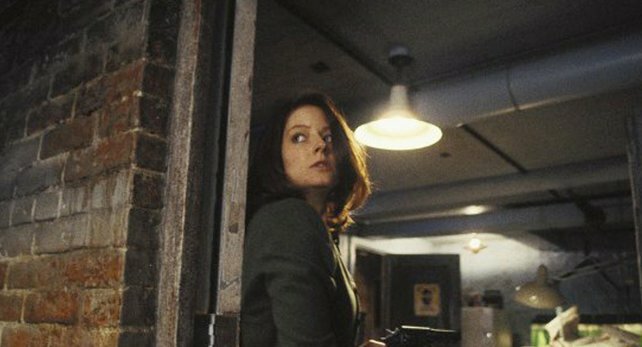 Filming there in 1990, Jonathan Demme’s Academy-Award-winning The Silence of the Lambs made use of several of the Westinghouse facility’s abandoned warehouses for some of its scarier sets. 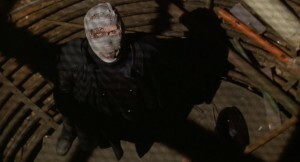 Sam Raimi gave us one of the most original and strangest superheroes with Darkman. 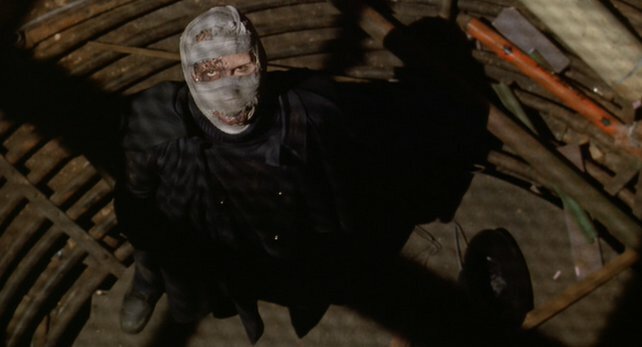 Just as with Raimi’s Evil Dead franchise, Darkman has garnered quite the cult following over the years. The abandoned factory where our protagonist holes up was filmed in and around several industrial areas in Los Angeles’s Central City. Unlike your typical industrial film location, most of Mad Max: Fury Road was shot from the vantage point of its awesomely constructed vehicles: over 100 insanely designed mash-ups of classic cars, monster trucks, and military and industrial vehicles. 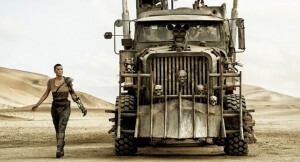 The main vehicle, the War Rig, is an 18-wheeled hybrid hot-rod and semi-truck that serves as a mobile base of operations for the heroes of this apocalyptic adventure, one of the best films of 2015. From Fight Club (1999) to Gone Girl (2014), director David Fincher deftly uses locations to create moody atmospheres for his thrillers. The final act of Se7en was bleak and unflinching, expertly capturing the performances of its actors and making use of stunning cinematography. 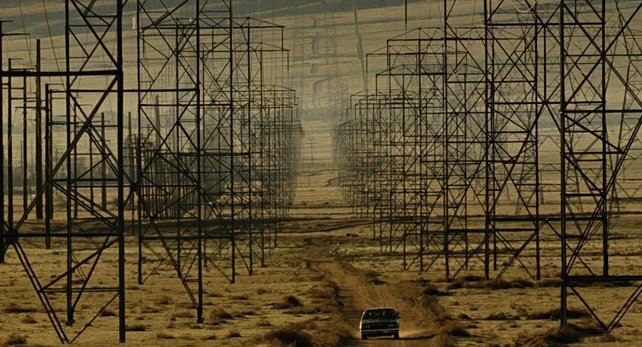 But it was the featureless stark landscape staked by giant electrical pylons that really set the tone for the final chapter of the film. 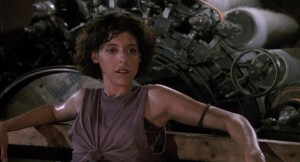 Set in Detroit, this hyper-violent cult classic features many industrial locations with its memorable finale taking place in an old steel mill. 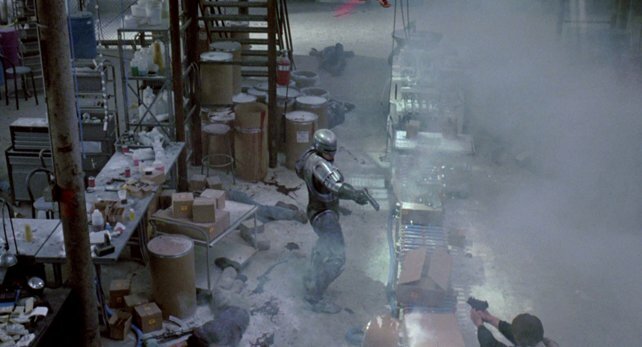 The abandoned Duquesne Steel Works, just southeast of Pittsburgh, was used to shoot this final confrontation where Robocop finally takes out the bad guys. The plant had closed down in 1984. 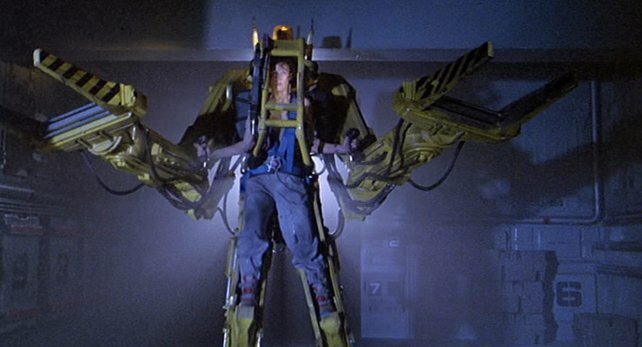 James Cameron loves using industrial locations in his films (he made this list three times). 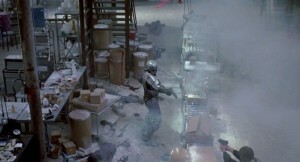 With Aliens, Cameron wanted to portray a dark, wet environment where the alien monsters could blend in. 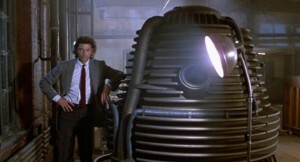 Specifically, the alien nest was shot at the decommissioned Acton Lane Power Station in London. It was considered a perfect place to film because of its grilled walkways and numerous corridors. Tim Burton revisited the location to film his iconic Batman (1989). 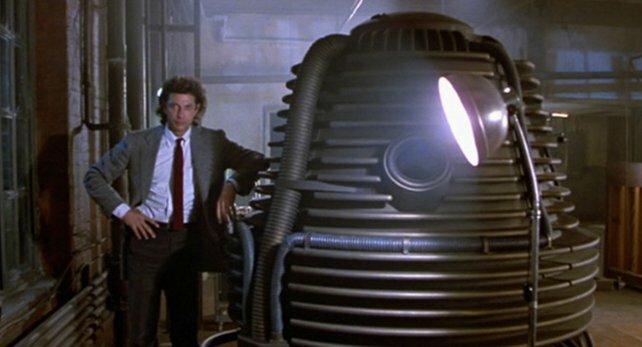 Most of Seth Brundle’s awesome transformation from man to insect-monster in David Cronenberg’s The Fly takes place in his laboratory/home — a converted loft space in what once was an industrial warehouse in Toronto’s Liberty Village. The high rafters made for some great special effects work in the scenes where Brundle starts climbing the walls. 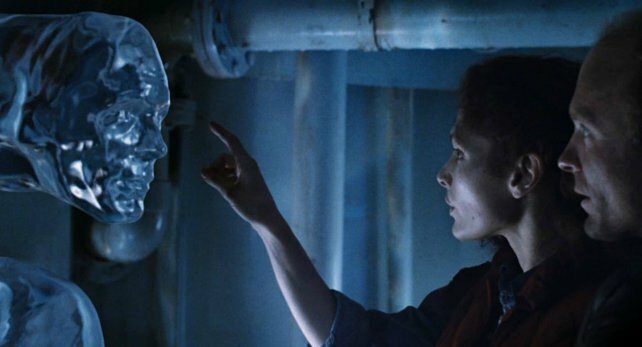 For our final entry, and one of the most memorable of industrial locations on film, we look again to director James Cameron. 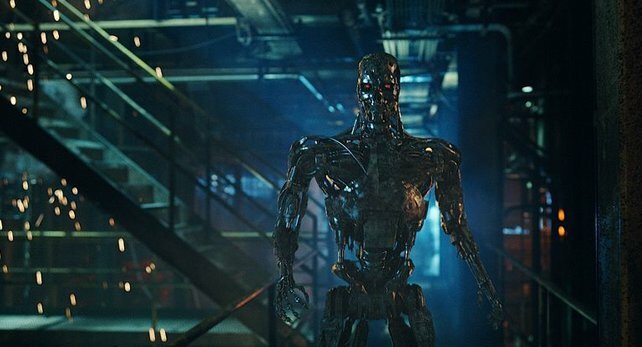 Unforgettably, the final confrontation between the Terminator and Sarah Conner is set in a metal forming factory. 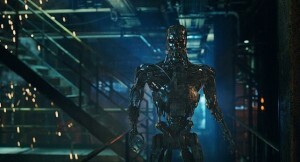 The nearly unstoppable killer cyborg from the future is finally terminated itself when crushed by a hydraulic press. 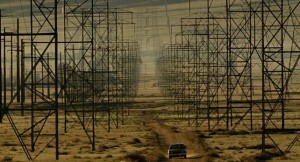 This exceptional ending was filmed at Kern’s of California in City of Industry outside of Los Angeles. Why Not Put Your Industrial Location on Film? Next time you walk the floors of your manufacturing facility or distribution warehouse, take a moment to think about how the concrete, brick, piping and metal are not just functional elements of the structure, but could be inspirations for a horror or science fiction film (or even a comedy — take Charlie Chaplin’s Modern Times , for example). Your facility could be a great film location, which could turn it into an additional source of revenue. Film scouts are always looking for the next great location since it’s cheaper to shoot on site than it is to build a set. There are lots of resources online where you can learn how to get your location listed and find out about standard rates for renting your location to film crews. And if you have a favorite horror or science fiction film that features an industrial location, please leave a Comment and tell us about it. Happy Halloween!